The birth of Jesus has been well chronicled, as have his glorious teachings, acts, and divine sacrifice after his thirtieth birthday. But no one knows about the early life of the Son of God, the missing years—except Biff, the Messiah's best bud, who has been resurrected to tell the story in the divinely hilarious yet heartfelt work "reminiscent of Vonnegut and Douglas Adams" (Philadelphia Inquirer). 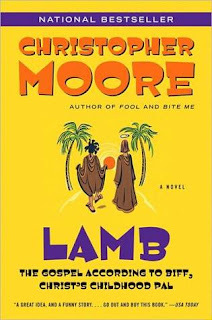 Let me start off by saying that I love Christopher Moore! His zany humor makes me laugh, and his books are so unique that I keep reading them. I don't know why, but this one just didn't work for me. Raziel, an angel, is ordered to return to Earth to get a new story for the Bible. Little is known about Jesus' life from the time he was a child until he became the Messiah, so God wants the new Gospel to be written by Levi (otherwise known as Biff) who was Jesus' (referred to as Joshua in the book) childhood friend. Raziel resurrects Biff from the dead, and he takes him to a modern-day hotel where he can write his story. He is also given the Gift of Tongues so that he can understand all languages and knows the words for everything. Biff's story is quite a creative one! I have to hand props to Moore for that. One example is how Biff claimed that it was he who hung Judas from the tree and that Judas never committed suicide. That part I thought was actually kind of cool and how Moore laid out the backstory to make that seem plausible. Because Joshua/Jesus knew that he was supposed to remain pure, he bought prostitutes for Biff and had him explain to him everything that was going on so that he could understand why it was sinful. Parts like that were funny and this is the type of off-beat humor that I expect from Moore. However, the majority of the book was very "meh" and I felt like I was just slogging my way through it. I just wasn't feeling it. Nevertheless, I'm still a Moore fan and will continue to read his books! If you've never read Moore or any satire, I recommend A Dirty Job which is one of my favourites. 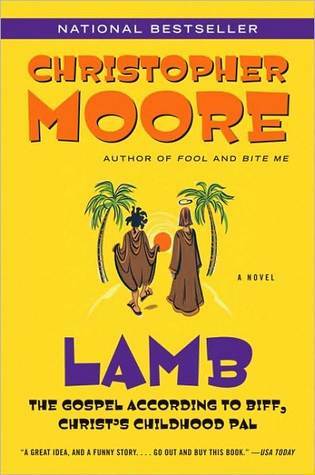 Sorry to hear Lamb wasn't as good as some of Moore's others. I haven't read it yet, but I remember a friend mentioning that it was taking her a while to get through it. I agree with you - A Dirty Job was great! Hilarious! Congrats on another Big Book - you had quite a summer!